Lithium Polymer (LiPo or Li-po) batteries offer many advantages over traditional types of rechargeable power sources. Their versatile applications range from single cell lipos powering micro-controllers to larger packs powering motors. So if you are planning on using lipos in your next system, this guide is for you. Lithium polymer batteries are the technologically evolved versions of traditional Lithium-ion batteries, so let’s try to understand lithium-ion technology first. Li-ion batteries are widely used in today’s consumer electronic devices because they offer three major advantages over traditional rechargeable batteries. No Memory Effect – Memory effect, in short, refers to the battery’s loss of capacity due to partial discharge cycles. Li-ion batteries do not suffer from memory effects. These batteries are designed to be recharged without the need to fully discharge/drain them. In fact, this process of fully discharging before a charge cycle, also known as deep-cycling, should not be performed during regular usage as you risking doing more harm than good to the battery cells. Low Self-Discharge – When not in use, batteries can slowly discharge. Lipos have a low self-discharge rate of approximately 5% per month. In contrast nickel metal hydride (ni-mh) cells typically see 30% per month and 10% for nickel cadmium (ni-cd) batteries. This of course varies depending on the storage temperature and the brand of the cells, but in general Lithium batteries are good at retaining their charge. Improved Chemistry – The Lithium-ion battery’s improved chemistry allows for greater energy density, it allows for high open voltage potential (3.6v to 3.7v per cell), and it allow for very high discharge currents (good for motors and high power applications). Lithium-ion batteries represent a major improvement over ni-mh and ni-cd battery technology. So how do Lithium Polymer cells differ from Lithium-ion? Lithium Polymers take this technology to the next step by improving its chemistry. The primary technological difference is that the electrolytes are held in a polymer composite (as in Lithium polymer) instead of an organic solvent. What does this all mean to you as a user? Let’s examine some of the additional benefits of Lipo batteries. 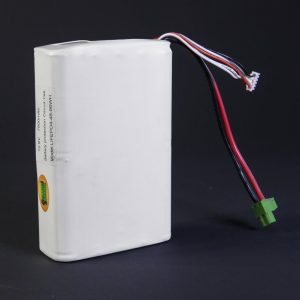 Lithium Polymer batteries are favored by radio control enthusiasts and are gaining popularity in many other applications including robotics, some newer consumer products, as well as other system integration projects. Battery packs consist of one or more lipo cells. The arrangement of these cells determine the battery pack’s voltage, capacity, and C rating. The cells can be arranged in parallel and/or series where voltage is determined by the number of cells in series, and capacity by the number of blocks in parallel. All the cells in a battery should be of the same type to maintain similar cell characteristics. Mixing types can cause packs to under perform or deteriorate in an unsafe manner. Having a poorly matched or misused pack can also lead to unbalanced cells (more on balancing below) which can deteriorate your battery packs and lead to further complications. Let’s examine these parameters in a bit more detail. Voltage – The pack’s rated voltage is determined by the number of lipo cells placed in series. Instead of indicating the voltage, packs will sometimes indicate the number of cells in series (indicated by #S, where # is the number of cells in series). To determine the voltage of these battery pack, you multiple the number of cells in series by the cell voltage (3.7v). C Rating – The final section criteria for battery packs is their C rating. The C rating of the battery is the maximum continuous discharge rating of the lipo cells and it determines how many amps your system can pull from the pack without overheating it. Discharging batteries at higher rates will raise their temperature and can lead to combustion. Both capacity and C rating play an important role in determining the maximum discharge rating. Typical C ratings are 10C, 15C, 20C, 25C, 30C. Make sure the battery packs have the appropriate C rating to power your system. Lipo batteries come in all sorts of configurations and sizes but it may be necessary to assemble custom packs in order to achieve high voltage or greater capacity. Packs can be assembled from individual cells, or commercial packs can be combined into a larger battery using various y-harnesses (Figure 4). When assembly custom packs, be sure that all the cells are equivalent. Avoid mixing old and new cells, avoid mixing brands, avoid using different sized cells or packs. The next section will focus on some of the shortcomings of these batteries and identify some of the safe usage practices for working with lipos. The principal downside is the risk of fire and/or explosion of lithium batteries. All vendors warn users to exercise extreme caution when using these batteries and the sections below will highlight some of the issues and preset some usage guidelines. Prior to each use (installation/charging/connecting/etc) run through the following quick inspections. First, inspect the pack for any signs of damage. Look for punctures, dents, or bloating of cells. Dings and dents can lead to bloating which is an indication of a serious pending problem. Discard the battery in a safe manner if any such damage is noticed. Before connecting the battery verify that no shorts exist in the circuit. Shorting the terminals of a battery can quickly exceed the maximum discharge rate and can result in fire and/or explosion. Verify that the connectors are in good working condition. Build-up or poor contact on the connectors can lead to arcing and overheating. Finally, make sure that the batteries are properly charged. Lipo cells need protected from overcharge. During charging, the voltage should be limited to no more than 4.235 volts per cell to avoid damage. Overcharging is one of the primary causes of battery failure and extreme caution should be exercised in systems that implement chargers. To prevent some of the over voltage or over-current concerns, batteries should also be charged at a limited current. If implementing a lipo charge circuit, look for lipo specific charging ICs to provide the necessary protection and monitoring mechanisms. We will be covering lipo charging ICs in a future article. If charging battery packs with an external (commercial) charger, be sure that it is designed for lipos. Chargers often have a limitation on the number of cells that can be charged, as well as a maximum charging current (Using a Y-harness on smaller packs can be handy for this reason). The general rule-of-thumb for a safe charging is to limit the charge rate to no more than the capacity of the battery, so a 2000mAh pack can be charged with a current up to 2A. Do not leave the packs unattended during a charge cycle. Keep an eye on it, and if for any reason the packs start to expand or react in any unexpected manner, disconnect the charger. It is also a good idea to place the packs in a fire resistant container while charging. Products such as the LipoSack will help to prevent some of the damage that can be caused by an exploding lipo pack. Packs typically have a charge cycle limitations of approximately 300 to 500 cycles before the maximum capacity drops to 80% of its original value. The capacitance is also influenced by the usage and environment of the battery pack. We’ve discussed the importance of carefully monitoring the battery voltages as well as the importance of using the same cells in multi-celled battery packs. It is particularly important that the individual cell voltages are equalized during charging. Most modern lipo packs are shipping with a balance connector. These connectors allow chargers to monitor individual cells voltages. Upon detecting a difference in the cell voltage, chargers can initiate a balancing cycle to equalize the cell voltages. This will help to ensure safe and optimal performance as well as pack longevity. Lipos have a unique, near flat discharge curve (Figure 6). The voltage of the pack will remain fairly linear up until it starts reaching its critical voltage. Because of this characteristic its possible to detect when the battery is running low. When the cell voltage drops to around 3.0 volts per cell, the load should be removed from the batteries to prevent damage. Over discharging the battery will shorten the lifespan of lipo batteries. Commercial batteries such as those found in laptop computers have protection circuits that prevent this problem. However, raw battery packs, such as those used in the radio control industry do not have any protective circuits built into them. Some radio control components such as speed controllers will have some limited protection. It is important to properly monitor these batteries especially if they are powering critical systems. Most battery cut-off systems are designed to turn lipos off at around 3V (per cell). When the battery cells reach critically low voltages the battery should be completely disconnected from the electrical circuit. This is typically between 2.7V to 2.5V depending on the specific chemistry of the battery. For this reason avoid soldering lipo cells directly to your system. When choosing connectors make sure that they can handle the necessary discharge currents. Connector should be able to handle the high current and have low resistance to prevent heat build-up. Poor connectivity can lead to arching and may fuse the connectors together. The list below contains common lipo connectors each with a maximum current rating. JST – This style of connector is common on smaller packs. They are one of the lightest connectors and are available from a wide variety of vendors. They feature a polarized connector, and are assembled via crimping the pin to the wire. Unfortunately they only handle up to about 5amps of current so they aren’t used much in motor applications. Deans Ultra Plugs – Another standard when it comes to plugs. This are ubiquitous and weight in at around 4.7 grams per pair. The Deans Ultra Plugs are light, yet capable plugs and are commonly found on a variety of battery packs and chargers. This are capable of handling up to around 100 amps of current! This plug requires the wire to be solder (not crimped) to the plug. Deans Micro Plugs – Presented as a light weight alternative to the Ultra series, this 2-pin connector is designed for lower power, lighter weight applications. The connectors are gold planted, polarized connections that require soldering. These can handle currents up to about 15amps and a pair of these connectors weight under 1 gram. Anderson Powerpole – This line of connectors come in a variety of shapes and sizes supporting everything from 18 gauge all the way down to 0 gauge wire. The size varies depending on the wire gauge, and the max current rating for these products vary from 15 amps all the way up to 180 amps. These can be soldered or crimped depending on the size. If you have trouble handling the Deans Ultra Plugs these make a nice alternative as their plastic casing is larger making them a bit easier to handle. Multiplex 6-pin Connector – This connector is unique in that it houses 6 pins. When dedicating three pins to positive and three to negative, the connector can handle up to 50amps. The pins can however be used for control signals. When using in this application this plug can be used to connect 4 servos, or even 2 brushless motors through a single connection. A variety of other generic and proprietary connectors exist. With any application, the use of polarized connectors is highly recommended. Keep your batteries disconnected. This will prevent any trickle currents from over-discharging your battery packs. Storing battery packs in a fire resistant container, such as the LipoSack mentioned above, is also a smart idea. Use these containers during transport as well. Damaged or deteriorated cells can ignite a fire even after being inert for a period of time. In general these packs are pretty robust and have a decent shelf-life as long as they are treated properly. Use the precautions presented here to avoid the hazards and you should be able to enjoy all the benefits of lipo batteries. We hope that this guide was helpful to you in some way. If you find any information that may be incorrect or out of date, please let us know so we can update it for other readers. If you have any questions, don’t hesitate to contact us.